I like Long Beach, and I’m thankful it’s home. Last summer, as I rode my bike along the red path overlooking the bay, I thought the same thing. Living in between the Atlantic Ocean and the bay is like living at a vacation spot. The beach is beautiful with soft sand and rushing waves. The boardwalk is great for running, biking, or walking with a picturesque view. I can bike anywhere and don’t need to depend on a car; everything seemed perfect in Long Beach. Then Hurricane Sandy flooded our town. The ocean met the bay and filled our homes. 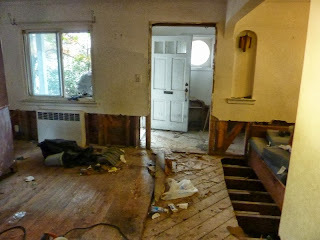 Water filled our basement and continued to rise two more feet on the first floor. Those who stayed, like my husband, lived through a scene from Titanic. Well, almost. Like many Long Beach residents who evacuated, we returned to a ruined home. Everything wet had to be tossed out to prevent fast growing mold; the streets became lined with ten-foot mountains of garbage. Brand new washers, dryers, ovens, and mattresses waited their turn for the crane monsters to lift them away. 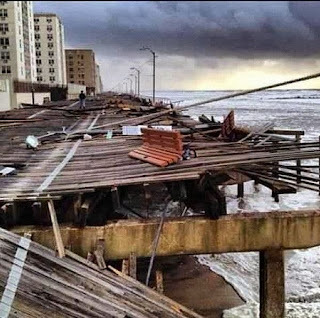 The surging water had smashed the boardwalk and carried sections of it blocks away as if a bomb had exploded. The National Guard drove army trucks filled with emergency supplies to central areas. The Recreation Center became a storage place for donations. We filled yard bags with needed supplies, towels and warm clothes for all of us. We wore our donated FEMA clothes, happy to have more layers as the temperature dropped in our drafty house. Nothing was the same. Even the evergreen trees turned burnt orange from salt water. It didn’t feel like home for more than half a year. But I have to thank God for blessings today. Samaritan’s Purse Ministries is going to fix our home sometime around mid-October. Shortly after Hurricane Sandy hit Long Beach, Samaritan’s Purse volunteers came to help our town and set up their offices at our church. I’ve heard of their ministry through church and knew they travel all over the world to help where natural disasters occur and help the poor, but never thought we’d experience their help personally. Another special aspect of how this ministry works is that they depend on volunteers and even our family will be required to volunteer and help with another family’s home. It will feel good to encourage someone else going through a similar experience. Hopefully this will be something we can continue even when our home is done. God is so faithful. Even though our hope and faith sometimes wavered, He had a plan. Going through hard times does bring blessings we could never experience otherwise. It opened our eyes to have compassion for others who experience a similar loss and to appreciate the wonderful people who care and go above and beyond in helping and providing for the needs of others. Every act of kindness during that difficult time brought tears to my eyes and prayers of blessings for them in return. 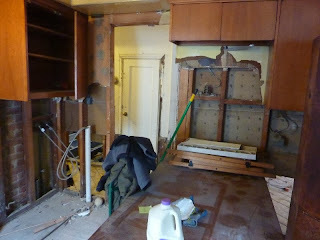 I intend to update posts of the progress in our home. Can’t wait!